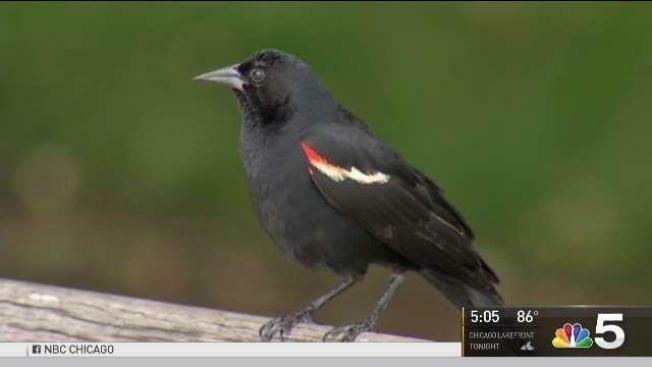 It's that time of year in Chicago: Summer weather and the return of the migratory and sometimes aggressive red-winged blackbird. Ash-har Quraishi reports. It's that time of year in Chicago: Summer weather and the return of the migratory and sometimes aggressive red-winged blackbird. "We have them for the most part in summer, spring through fall," says Josh Engel, a research assistant at the Field Musuem. "They're a beautiful bird, the males and females look very different to one another. And most people noticed the males because those are the ones that are really aggressive." Male birds are easily recognizable with their black plumage and tell-tale red shoulder stripes. Highly territorial, birds would've made Hitchcock proud. Survivors have shared their close encounters with the birds all over YouTube. On a stretch of North Avenue in Chicago Thursday the angry birds could be seen milling around in the foliage. Some say they've been dive bombed in recent weeks unexpectedly. Sot stan carpenter - dive bombed by bird 25:28 "I was wearing a Cubs hat of all on the South Side of Chicago and I've got birds attacking the top of my head so I had to take it off. It was crazy," said Stan Carpenter, who told NBC 5 he was dive-bombed by one of the birds. Runner Justin Breen has had a brush with the foul-tempered fowl on his jogging path in Glenview. "You'll just be running and then all of a sudden. Right from behind they'll come swooping down at you," Breen said. But experts say the red-winged blackbird is only doing what any good parent would do. "They want to protect their nest. They are simply doing what they need to do to make sure that their young are safe. Healthy. Fledge successfully and survive," Engel said. Still, getting dive-bombed by a bird is enough to frazzle anyone. "I hear that noise I am a very aware that and I'm looking for the bird right now it's in there somewhere that there's a chance it could could come down and get it us," Breen said.